Global economic slowdown fears plus rising equities sent USD/JPY to fresh yearly highs. US Treasury yields posted a modest daily advance but subdued. 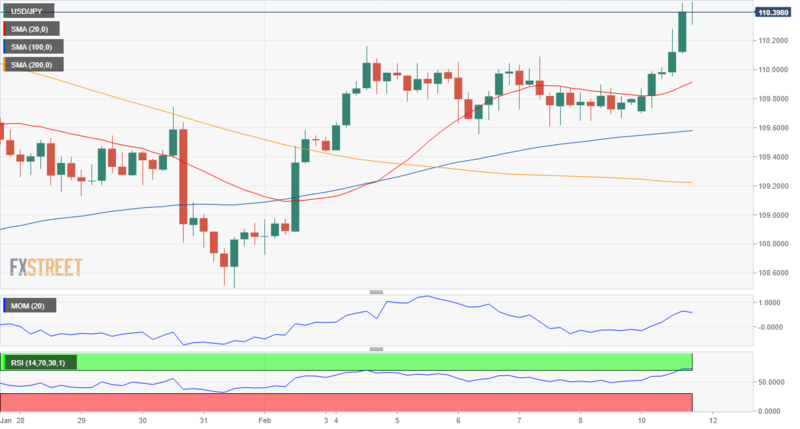 The USD/JPY pair trades at fresh 2019 highs in the 110.40 price zone, underpinned by the positive tone of equities and a modest uptick in US government bond yields in the American afternoon, but mostly up due to broad dollar's strength driving the pair, amid mounting fears of slowing economic growth in other major economies, including the UK, the EU, and Australia, according to forecasts released last week. Meanwhile, the US and China are set to resume trade talks this week, while US top lawmakers are set to resume discussions to avoid another shutdown. Both factors can play against the greenback with negative outcomes, but don't seem a concern right now. The pair reached the 110.45 price zone, a strong static resistance without retreating much after the first test of the area, a sign that bulls are in control of the pair. The 4hours chart shows that the RSI entered overbought territory, rather a result of the previous range trading than of a strong upward momentum, as the pair is measly 30 pips above its previous monthly high. Still, the pair is also above its 100 and 200 SMA which lack directional strength above a major Fibonacci support at 109.05, all of which maintains the risk skewed to the upside, with room for an extension up to the 111.40 price zone.